Scripture speaks of miracles wrought through relics: a dead man was raised when Elisha’s bones touched him, and the clothing of Jesus and His apostles healed the sick. In the early Church, Masses were celebrated over the bones of the martyrs, and phials of their blood have effected countless miracles. Direct successors of the Apostles themselves speak of venerating relics; Church Fathers encourage it; throughout the ages of Catholic legacy, relics of the saints are always present. The Church takes diligent care in preserving and documenting the authenticity of her relics. Best-selling author Joan Carroll Cruz takes full advantage of these resources. With painstaking research, she exposes the details behind hundreds of the Church’s most famous and beloved relics. She covers 38 second-class relicsof our Lord and Lady, such as the Holy Grail and Our Lady’s Veil, and relics of all sorts from 75 favorite saints, such as St. Mary Magdalene, St. Agnes, St. Charles Borromeo, St. Francis of Assisi, St. Maria Goretti, and many more! 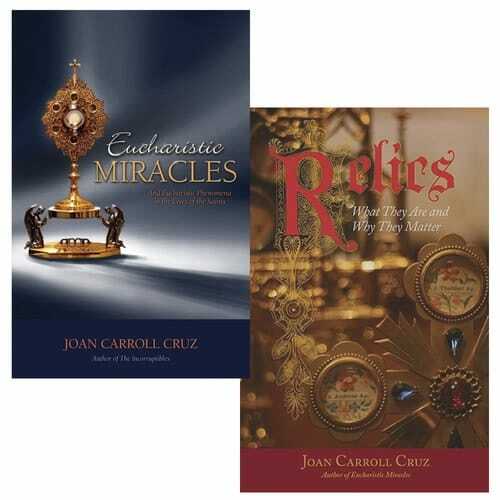 Relics is a unique collection of years of dedicated research about the lives of the saints and the mementos they left behind, to remind us of their presence and intercession for us.